One more day off til I go back to work! Sad to see vacation end, but I am on winter hours so work is lighter, more time to craft! YAY! This card will be entered into the Challenges at; Power Poppy, Grab A Map and Simon Says Wednesday, Use Pattern Paper. This is the Page Map I chose. I used the Power Poppy stamp sets; In Praise Of Sunflowers and Go Wild! Image stamped in Raven Black ink and colored with Copic Markers. If you look at the top of the sunflower panel you can see an itty bitty piece of Designer Paper sticking out, black and white striped on an angle. 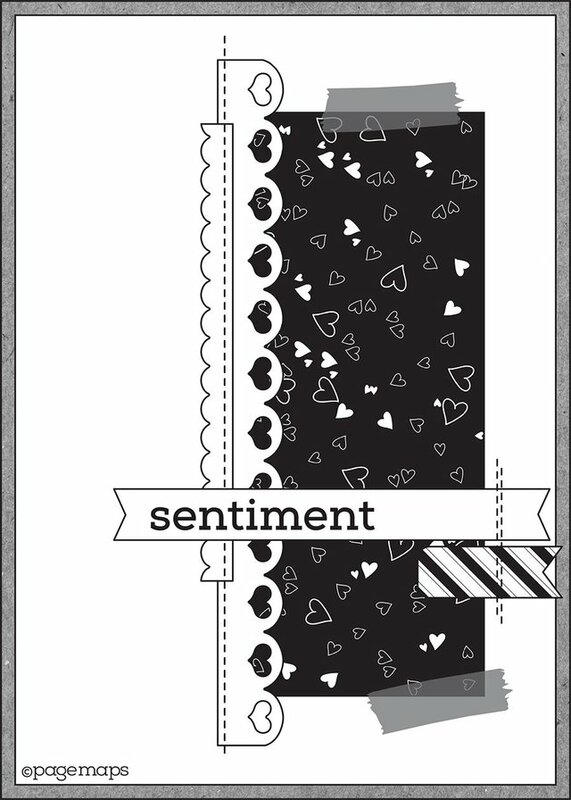 MFT dies; Cross Stitched Rectangles, Open Bracket Border and Notched Border. I love this Sketch and all of the layers you can add. So much FUN! Where to begin??? I love everything about it....from how you interpreted to sketch to how perfectly you put it all together. Your coloring of the sunflower is absolutely perfect. Whoozer! This is a fun sketch, Map and I see that you took it to the next level. The great colors was the first thing that I noticed. What a Pop and a statement. Then you had a lot of fun with the layering of the papers and coloring that gorgeous sunflower. I love your little splashes of washi tape. Wonderful textures and layers going on here! Not to mention the colors and your beautifully colored sunflower. A gorgeous take on the sketch Donna! You picked a great sketch to use. Love that gorgeous sunflower. We could use some sunshine here, that's for sure. Love all of your other pretty elements to make this card so special. Oh wow, this is just beautiful! That is quite a complicated map and you have really nailed it. I love the colors with just the pop of green, brings the whole thing together. Your sunflower if fabulous too. This is gorgeous!!! Wow that is stunning, lovely flower and oh so pretty border combos and like the pearl accenting too, great sentiment! Your card is so gorgeous with those pretty colors and dies and a great interpretation of the map you chose. I always love sunflowers. Love your sunflower card, great colour combo and brilliant job with the sketch. Nobody does sketch challenges better than you. Your ideas are always so creative and fun. Love it. Beautiful... oh I do love this sunflower and you used the sketch awesome with it. Just beautiful! Love the sketch and the pop of green works so well! AWESOME card! This is so pretty Donna! I love how you’ve used the sketch and widened the pieces to make the image work! Lovely! Thanks os much for joining us at Power Poppy!